Having worked for most of my life as a sculptor with the hard, resistant and intractable material of stone I was drawn in 2006 into the exploration of a material that is its opposite. The frail and brittle nature of glass was its greatest attraction although the fact that the sand of which it is partly composed is eroded stone was equally fascinating. The desire to work with the material arose out of conversations with a fellow artist, Saturio Alonso, around the limitations of certain materials or, more exactly, their unsuitability to the expression of certain ideas. For example neither stone nor metal are the ideal materials for the expression of impermanence no more than language is suited to the expression of silence. The challenge of how to express the ineffable led to the visual metaphor of the glass bell; its ring is its destruction. 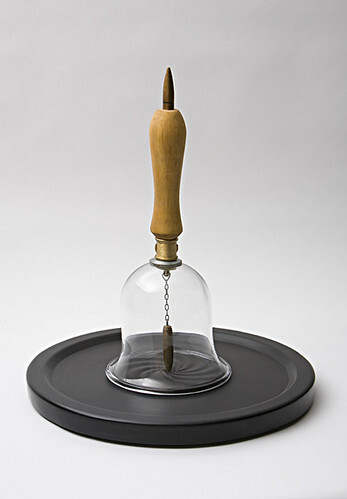 The first work made in this series was The Philosophers’ Bell. 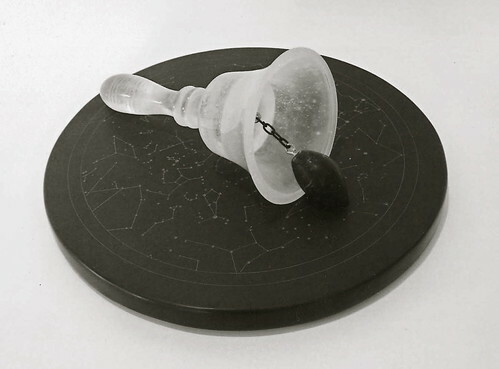 The Philosopher’s Bell, cast glass, stone. 15 x 35 x 35cm. 2006. The creation of this series followed a fallow period after building a house and studios for my wife and I following our return from North America. The return to Ireland after twenty years abroad was unsettling and raised many questions as to the nature of cultural inheritance and national identity. Richard English has written about the “imagined community” of nationalism and the same words apply to national identities. We are all to some degree creations of our own imaginings. There are many who consider fluency in our native tongue to be a definitive requirement of Irish identity. For them, those Irish men and women who do not speak fluent Irish are poor representatives of the culture. As an Irish artist this is a contention I wished to explore and challenge. The work Teanga grew out of this engagement. It comprises a specimen jar filled with formaldehyde, but without a specimen. The absence is preserved. On the surface of the jar are inscribed the words: This is not my tongue. The specimen jar sits upon a base of slate into which has been inscribed the gaelic alphabet. The Irish word ‘Teanga’ is translated as both ‘language’ and ‘tongue’. 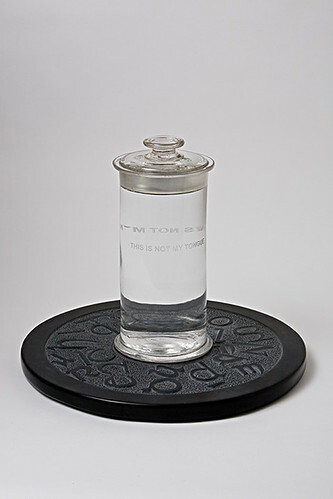 Teanga; glass, stone, formaldehyde, text. 28 x 35 x 35cm. 2006. Another work to grow out of this engagement with language and cultural inheritance was An Clog Éisteachta. Dineen translates this as “The Passing Bell’. A Passing bell was one rung to announce a death or a funeral and is symbolic of the passing away of any thing or person. It comprises a glass bell on the surface of which is inscribed the gaelic alphabet. Within the dome of the bell sits a clapper made from lead printing dies of the Roman alphabet. The handle of the bell is inset with thorns. Another work within this series was The Bell of Violence. A glass bell sits on a base of stone. A live bullet forms the clapper of the bell. Where the point of the projectile touches the stone a vortex is formed yet contained within the rim of the bell. 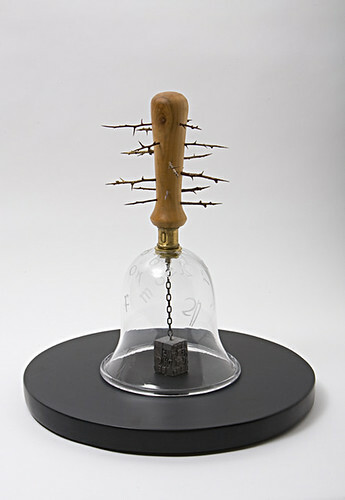 The Bell of Violence; glass, wood, stone, metal. 38 x 35 x 35cms. 2006.